Use this gift voucher on AllGifts.ie to order from Radisson Blu Sligo. Surrounded by wild and beautiful countryside, the Radisson Blu Hotel & Spa in Rosses Point, just 10 kilometres from Sligo town, is the perfect place to relax and explore the rich heritage of Sligo. Surrounded by wild and beautiful countryside, the Radisson Blu Hotel & Spa in Rosses Point, just 10 kilometres from Sligo town, is the perfect place to relax and explore the rich heritage of Sligo. Choose from 132 modern rooms and suites at our 4-star accommodation to enjoy generous amenities including Free high-speed wireless Internet, full leisure centre including an 18 metre pool and top rated spa. Use this voucher on AllGifts.ie to make a booking for Radisson Blu Sligo. Or you can order a Radisson Blu Sligo and make a booking directly with the hotel at a later date. Radisson Blu Sligo vouchers are posted out free of charge. 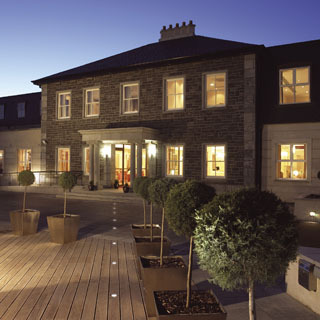 Located only 2 miles from Sligo City centre, the Radisson Blu Hotel & Spa, Sligo is situated on the way to Rosses Point. Sligo Airport in Strandhill is just 10 minutes away, while Knock Airport is 45 minutes away from the Airport. The hotel is within driving distance of Dublin (212 kilometres), Galway (143 kilometres), Derry (138 kilometres) and Belfast (200 kilometres). Surrounded by the gorgeous countryside of Rosses Point, the Radisson Blu Hotel & Spa, Sligo offers majestic views of Sligo Bay and the neighbouring mountains. Business guests appreciate our proximity to Finisklin Business Park as well as the short 5-minute drive to Sligo city centre. Take advantage of the outdoor recreation afforded by the beautiful landscape, including golf at championship courses and surfing at the beach, just 3 kilometres away. Choose from 132 modern rooms and suites at our 4-star accommodation to enjoy generous amenities including Free high-speed, wireless Internet. Savour finely crafted Irish and international dishes at the AA Rosette-accredited Classiebawn Restaurant, or visit Benwisken Bar for a refreshing pint and tasty bar food. Unwind in our well-equipped leisure club, which includes an 18-metre pool, Jacuzzi, sauna and steam room; or visit our top-rated spa for a soothing massage, relaxation therapies, or Elemis body and facial treatments. The leisure club and spa offer the perfect way to unwind after a day of conference meetings or before your wedding day. The hotel’s event space features 10 meeting rooms perfectly suited for productive meetings and elegant ceremonies.